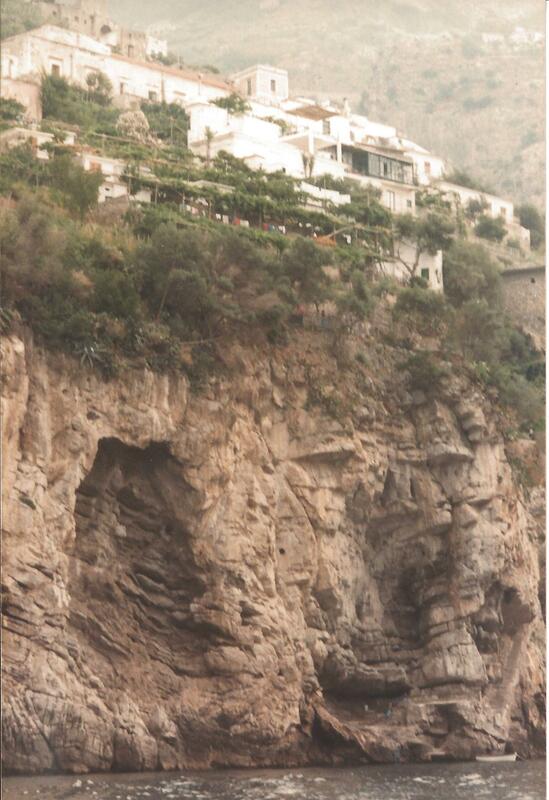 In southern Italy, the Amalfi Coast stretches from Naples to Sorrento. There may be morebeautiful places in the world, but I don’t know of any. It is all joined by a high coastal highway of one lane in each direction that winds its way snakelike, with hairpin turns and poor visibility, between cliffs and the Tyrrhenian Sea, the whole dominated by Vesuvius in the distance. Our destination was Positano, a much photographed town with small, red-roofed houses which sort of descended in steps from the roadway to a tiny harbor. It was reputed to be home to many artists and writers, but we didn’t know about that when we first noticed it in posters advertising the area. It seemed too pretty not to visit. Somehow, through a navigational error, we wound up in the next town, Praiano, in La Tranquilitat, a hotel overlooking the sea, which besides renting rooms, also rented tenting spaces, on several narrow strips of terraced cliffs. From the lowest of them, you could make a fun 50 foot jump into the sea, and then use a rock-anchored ladder to climb back up. We found out we were in the wrong place when we registered, but it no longer mattered. The place was incredible. 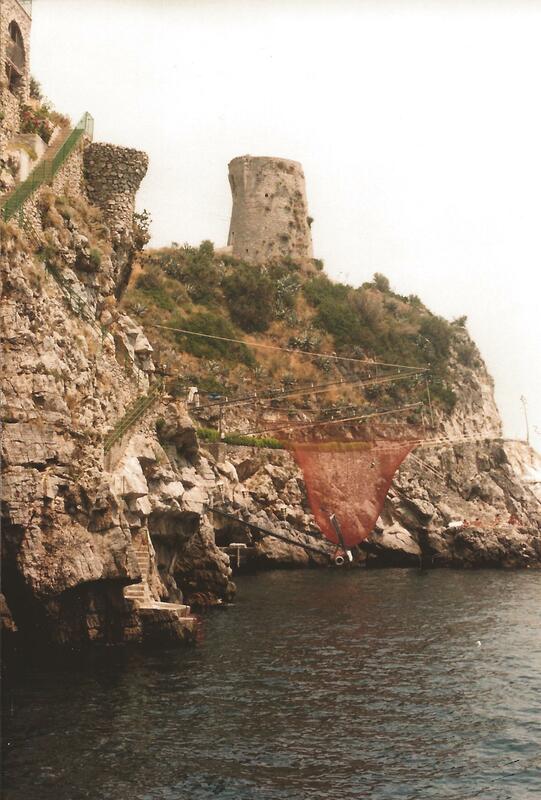 On its North side stood a stone tower, one of a series of towers erected long ago along the coast of Italy to ward off attacking Saracens and pirates coming in from the sea. Several rooms of the hotel were located in this tower. La Tranquilitat also had a stone patio which overlooked the sea, but was shaded by trellised grapevines overhead. Breakfast on this terrace was memorable not for the taste of the food, although that was no cause for complaint, but for the view of sea, cliffs, and occasional red-roofed houses. It was during the course of a breakfast that we met Carlo and Joanna, a young couple who raised buffalo for a living. You may wonder about buffalo being raised in Italy, but buffalo milk is essential for the production of quality mozzarella cheese. 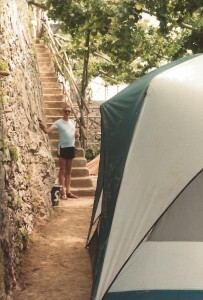 When they left, we were good friends, and they suggested we install ourselves in the room they were vacating, which we did, and for us that was the last of camping at La Tranquilitat. It was in its own way, the most beautiful room in which we had ever stayed. It was located on the top floor of the tower, with and excess of windows in all directions. Some of the windows overlooked the Tyrrhenian Sea, some displayed hazy views of distant Mount Vesuvius, and some others gave us a view of the Afrikaner Disco, located next door, which each morning required a catch of live fish to install under the glass of its dance floor. Please don’t ask why fish were needed under a dance floor. This is beginning to read dangerously like a travelogue, but it was just all too beautiful. I apologize for that. I just couldn’t tell about our musical evening at La Tranquilitat without introducing the place. Naturally, we also visited the nearby ruins of Herculaneum. Herculaneum had been a smaller and wealthier town than Pompei, and so it inhabitants fared better than Pompei’s in 79 AD, when Vesuvius erupted. More of its inhabitants survived. Some things never change. . .